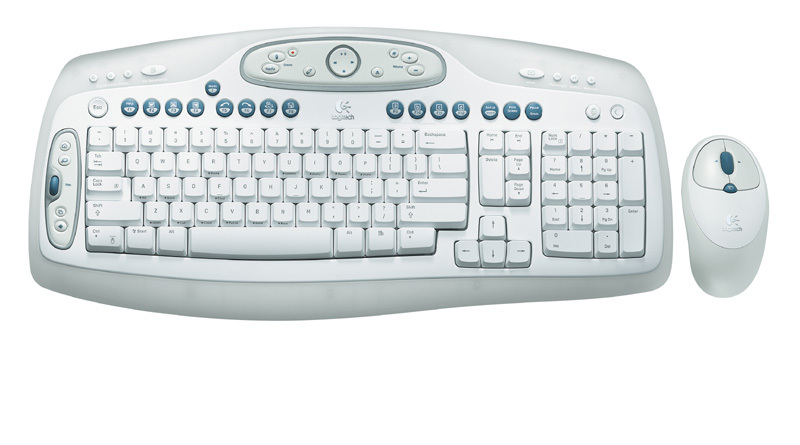 According to Logitech, the first "Cordless Desktop" (wireless keyboard & mouse) was invented by Logitech in 1998 and comprised simply a cordless (RF) version of a traditional keyboard and mouse. Keyboards and mice has come a long way since then -- volume controls on keyboards, special function keys to control DVDs/CDs, launch applications with a single key, horizontal and vertical scroll wheels on mice and more. In fact, wireless keyboards and mice have gone from being simple point, click and type devices to being complete PC control centers, as well as a media center for controlling CD music and DVD movie playback, playing My Videos, or displaying My Pictures. Even the look of the keyboard and mouse has changed from boring and beige to the sleek and stylish. Logitech has taken all of this advanced functionality and put it into their new Logitech Cordless Desktop LX-501 cordless keyboard and mouse, which they sent to TMC Labs for testing. I should point out that even for non-technical users, the PC has become a mini movie theater, a desktop stereo system, and a centralized hub to streaming audio and video content on the Internet, as well as pictures to share with family and friends. programs or menus that require searching and multiple mouse clicks to use. Logitech’s Cordless Desktop series, which includes the 500/501, LX-100, LX-300, LX-700, Express, and a few other models, is their attempt to fulfill this mission. Installing the Logitech Cordless Desktop LX-501 (white model, the LX-500 is black) was pretty simple. I inserted two AA batteries each into the mouse and the keyboard. Surprisingly, I expected the keyboard to require more batteries than the mouse, but that was not the case. Well, actually, the mouse uses more power than the keyboard due to the red optical light, but since a mouse is small, it cannot fit too many batteries. I figured the larger keyboard had more room to fit 4 AA batteries - not that the keyboard needs the extra "juice", since the keyboard has excellent power management built-in, but I figure 4 AA batteries will last roughly twice as long, so you won't have to change batteries as often. Anyone that had gone scouring for batteries in their home knows it can be a frustrating experience, so the less often you have to do it, the better. Although Logitech claims that the keyboard battery life should be 12 months on average anyway. Next, I connected the wireless transmitter/receiver, an approximately 6-foot long cord with a triangular shaped transceiver on the end, to the PC's USB port. The wireless transmitter also has a Y-connector that lets you attach it to the legacy PS/2 mouse port and the PS/2 keyboard port, though Logitech recommends using the USB port for sending/receiving keystrokes and mouse movements/clicks. The Windows XP operating system auto-detected the USB device and auto-loaded the appropriate driver without having to insert a driver CD. That's it. It was now up and running. I was able to use the wireless keyboard and mouse, however to get the advanced functionality such as the CD/DVD playback to work, I had to install Logitech's software. I installed this software and were able to change the default configuration for the various buttons. Both the keyboard and the mouse included with the Logitech LX-501 incorporate a wheel for scrolling up and down on the screen. In addition, the mouse features a scroll-wheel that not only performs vertical scrolling, but with a simple push to the left or right you can scroll horizontally to the left or right. I was able to move the mouse and keyboard up to 8 feet away from the wireless transceiver and it still performed. This was a decent range, though I have seen other wireless keyboards work from across the room. Perhaps Logitech weighed range vs. battery life and came up with the 8 foot range. Most people will be within 8 feet of their PC, although if you have a Windows Media Center Edition PC hooked up to a large screen TV (like I do), then you may be a bit further from the screen. The keyboard itself is very thin, definitely the thinnest keyboard I have ever used, and it has a 0° tilt which is supposed to be very good for your wrists and preventing carpal tunnel syndrome. The keyboard is surprisingly light which is good. Also, there are feet on the bottom that are only very slightly raised which I liked. The LX-501 keyboard takes two AA batteries which are included in the box. This Logitech keyboard truly enhances navigating through web pages, documents, etc. 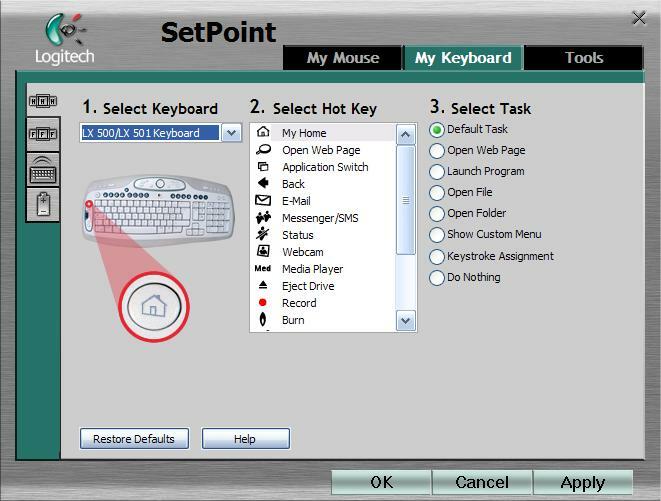 On the left hand side of the keyboard is positioned all the Web surfing enhancements including a scroll wheel, search, switch task, Home, and back buttons. Since most people use their right-hand to use the mouse and navigate the Web, it is interesting that Logitech chose to position the Web navigation keys on the left-handside. This was not by accident. According to Logitech using two hands to navigate and do the normal workload that one hand would do can relieve repetitive stress injuries and is more comfortable. I should mention that all the buttons are customizable to launch any program you want. The Search button was pretty neat in that it would launch your default search engine in Internet Explorer. I tried to get this feature to work within Avante Browser but it didn't work. I didn't try testing it with Firefox. Logitech has repositioned and eliminated some keys. The "Start" key on the right side is gone, the Insert key is moved to be a special blue round key, and the "CTRL" keys are a bit larger than normal keyboards. I liked the fact that Logitech moved the Insert key - I can't tell you how many times I accidentally hit the Insert key, change the mode to "Overwrite" and accidentally overwrote some text. However, I didn't like the repositioning of the Page Up and Page Down keys. Page Up and Page Down keys are usually in its own column which makes it easy to find these two keys and quickly page up/down. However, now the "End" key is above the Page Up and Page Down keys, so with this extra third key, I often found myself hitting the End key when I attempted to page up or I hit the Page Up key when attempted to page down. The Delete key is now the largest key on the keyboard - the size of two regular keys put together. So now when you get annoying spam you can truly enjoy hitting the big Delete key - "Take that spammers!" On the top right there are also four buttons with shortcuts to eMail (programmable to Outlook, Hotmail, and Outlook Express), Messenger, Messenger status, and webcam. On top are the traditional function keys which are now round in shape, blue in color, and have additional functionality. That is, you can press the "F Mode" button to toggle between traditional F1-F12 functionality and Logitech's special functions. For instance, after change the function key mode you can press F2 to launch Word. On the top left are keys to access your digital library (My Music, My Videos, My Pictures), as well as a My Documents button - all of which launch Windows Explorer to the appropriate directory. On the top of the keyboard there is a panel that contains all the multimedia buttons. The panel integrates with Musicmatch Jukebox and the Logitech Media Life software that is included with the LX-501. The buttons include Media, Create, Burn, MediaLife, eject, volume + and -, and mute buttons. In the middle of the panel is a circular button which contains play, stop, pause, and rewind functionality. From the Logitech software you can change the keys default behavior as well as turn on encryption for the keyboard so your keystrokes cannot be intercepted. Logitech also bundles a very good "media center" application - a centralized interface for accessing all of your media. It was pretty decent and probably would have used it more regularly had I not already had Microsoft Media Center Edition 2005 (MCE 2005) as my operating system. The mouse was very ergonomic and felt comfortable in my hand. In addition to its scroll wheel, it contained a unique Application Selection Switcher button which when pressed displays the list of running programs in the center of the screen and then you can click on of them to switch to it. Think Alt-TAB. Like the keyboard, the mouse came with two AA batteries. Although the LX-501 does not use rechargeable batteries for the mouse, the LX-700 model actually has a NiMH battery pack that is designed to last the lifetime of the mouse. It's roughly $20 more for the LX-700 vs. the LX-501. Similar to WiFi PCMCIA cards that let you set the power management for "Best performance", "Best Battery life", I'd like to be able to control the power management for the mouse and keyboard if it would let me increase the range a few feet. I'd rather go through batteries a little bit quicker and get a few extra feet so I can sit further from my TV display, which displays my MCE 2005's desktop screen. All in all, this is a fantastic wireless keyboard and mouse combo and I would highly recommend it.